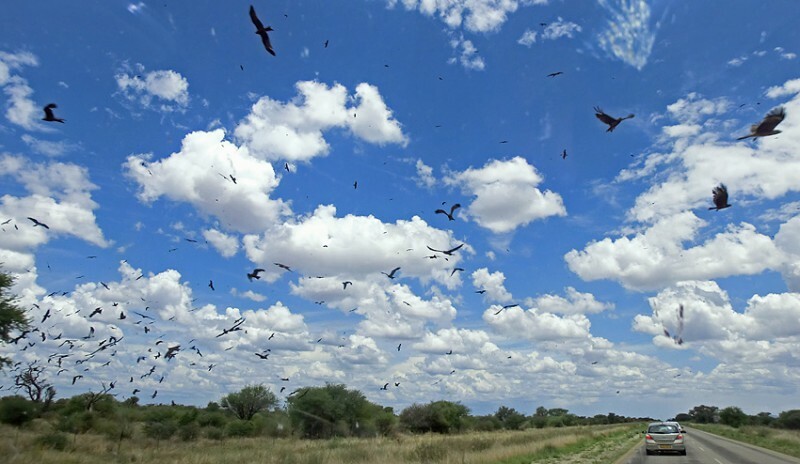 Namibia must be a great country for bird-lovers. According to Wikipedia here are 706 species. I think this post is about only one of them, but in really big numbers! I am certainly not an expert on birds so I hope there is someone out there that can help me understand what I saw. 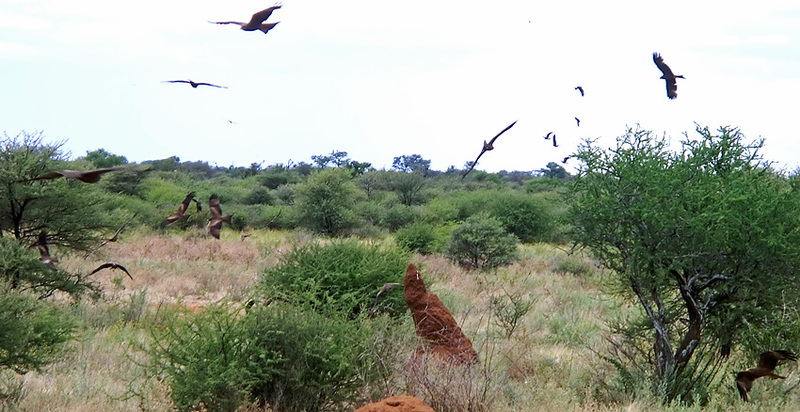 We were driving back from Wabi lodge in Waterberg on December 26 when we saw a lot of birds next to the road. I think there are close to 20 birds on this picture. I know it looks like they are “photoshopped” to be there but I promise you that every picture is real! It looked crazy and we started talking about the Alfred Hitchcock movie – “The birds”. How did they avoid collisions with the bushes and with each other? As far as I could tell they were some kind of hawks and they all looked the same. What were they doing? My only guess is that they were looking for food of some kind. We continued driving and very soon saw the same again. I did not see any collisions but there were so many and they were flying so close. 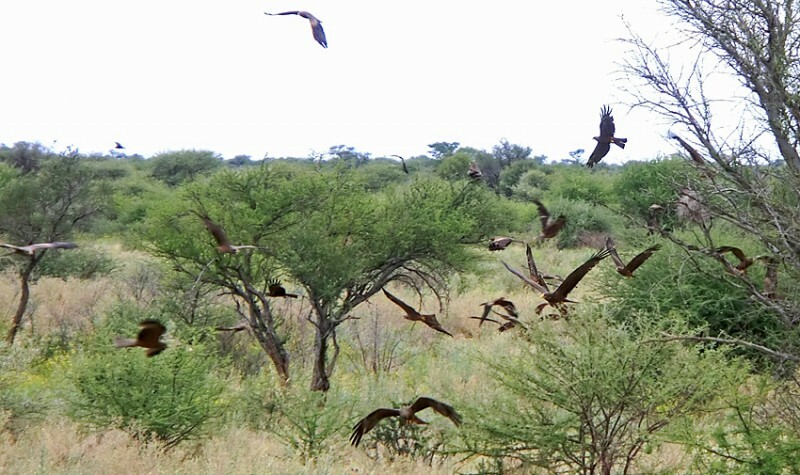 For me this was a unique and unforgettable experience and I really would like to know what made these birds gather like this. Tack för Hitchcock filmen ! Njuter av Dina bilder och visar dem ibland för vänninor utan dator. Hoppas Mamma snart åker ner o hälsar på Er. 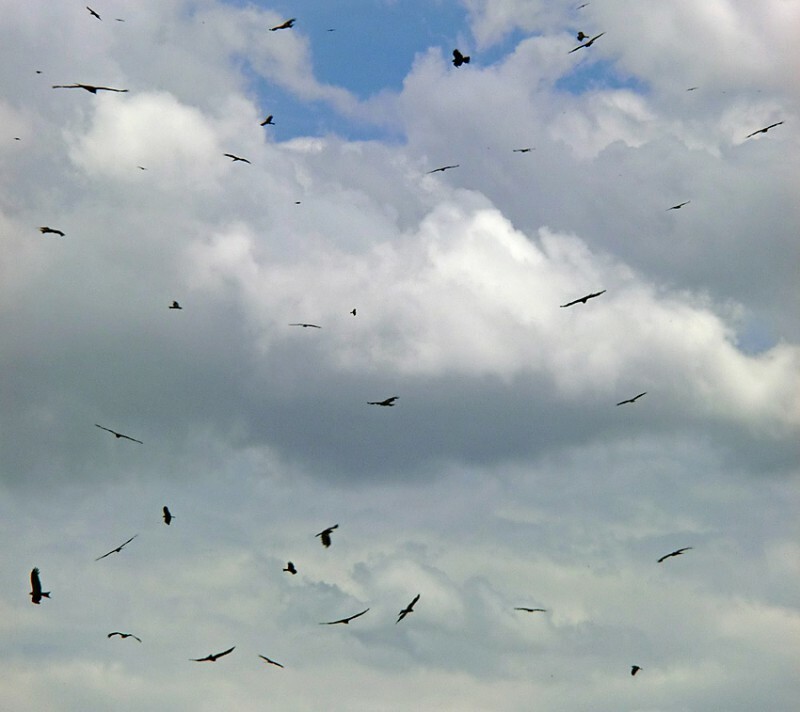 Burna gladar/Black Kites. Sociala djur, enstaka ses i Sverige varje år (50 förbi Falsterbo i höstas) och ibland häckar de. Tack Erik, rådfrågade Wikipedia och fick reda på att brun glada sannolikt är världens talrikaste rovfågel och att de ofta ses i stora flockar. De samlas ofta i termik och det kan det ju ha varit här. Googlade vidare och fann att de ofta kommer till Namibia då regnsäsongen börjar och stannar till mars. Hittade en rapport om att man på 70-talet sett flockar på uppemot 10 000 fåglar!